Diagnose and determine treatment for toxic exposures in small animals with this quick reference! 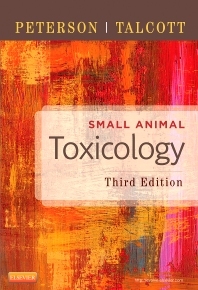 Small Animal Toxicology, 3rd Edition covers hundreds of potentially toxic substances, providing the information you need to manage emergency treatment and prevent poisonings in companion animals. To help you identify an unknown poison, this guide provides a list of potential toxins based on clinical signs or symptoms. It also includes a NEW color insert with 85 full-color photographs of toxic plants and of lesions associated with various poisonings. Written by respected veterinarian Michael E. Peterson and board-certified veterinary toxicologist Patricia A. Talcott, along with a team of expert contributors, this edition covers a wide variety of topics including toxicodynamics, toxicokinetics, effective history taking, recognizing clinical signs of toxic exposures, managing emergencies, and supportive care of the poisoned patient. Comprehensive coverage of toxins/poisons includes the full range of substances from acetaminophen to zinc, including home products, prescription medicines, recreational drugs, and more. Guidelines to evaluation, diagnosis and treatment include examinations of the source, toxic dose, toxicokinetics, clinical signs, minimum database, confirming tests, treatment progress and differential diagnosis for each specific toxicant. Coverage of common poisonous substances includes grapes and raisins, nicotine, mercury, mushrooms, Christmas-time plants, and snake and spider venoms. Toxicological Concepts section provides information on toxicologic principles such as history taking, providing supportive care, and managing emergency treatment. General Exposures section addresses nontraditional toxicology such as indoor environmental air, pesticides, pharmaceuticals, and toxicities in pregnant and lactating animals. Miscellaneous Toxicant Groups section covers commonly encountered specific toxicants, the proper use of diagnostic laboratories, use of human poison control centers, and antidotes for specific toxins. More than 50 international contributors provide up-to-date, authoritative advice on treating poisonings and intoxications. 4. Effective Use of Veterinary Poison Center NEW! 13. Litigation and Toxicology NEW! 15. Responding to Mass Exposures NEW! 18. Considerations in the Pediatric Poisoned Patient NEW! 19. Considerations in the Geriatric Poisoned Patient NEW! 21. Poisoning in the Small Mammal (pocket pets) NEW! 22. Poisoning in the Avian Patient NEW! "In preface, the authors indicate their remit was to produce a valuable aid to the clinican in practice and also to provide a textbook for veterinary students. Thus the earlier sections are obivously directed at setting the scene and outlining the fundamentals of toxicology...For the most part, UK and European users will find the book extremely valuable...The latest edition revision will certainly be on my shelf and no doubt, end up looking as battered and loved as the earlier editions." "Written for students and vets in practice, this toxicology guide provides all you need to know to deal with a case of poisoning...Whether based on clinical or toxic signs, the practitioner will get the bext advice. Even if we all wish to never need such a book, no doubt it will be extremely useful one day."